After we said goodbye to the lovely ladies at Sugar Circus Bakery, we made our way to Austin’s famous 6th Street…our afternoon destination? Alamo Drafthouse Cinema’s The Ritz Theater. Alamo Drafthouse started in Austin in the 1970s and have since expanded to locations all over Texas, including San Antonio and Houston. They offer a wide range of first-run, eclectic, and classic movies…along with great food, cocktails, wine, and beer. Many of you know that Michael and I love movies nearly as much as food. In college, we took a Film Appreciation class together, and one of our favorite directors is Alfred Hitchcock. We were thrilled to see that The Ritz was showing a remastered Vertigo during our trip, and it was the perfect venue for this classic thriller. The two-screen movie theater dates back to 1920s, and it has a lot of charm. We took our seats just before the movie started and ordered a couple of cocktails and appetizers. We selected two of their adult milkshakes: the Brandy Milk Punch Milkshake and the Lemony Thickness. The milk punch shake packed quite a kick and reminded us of the brandy milk punch that we have enjoyed in New Orleans. The Lemony Thickness blended vanilla ice cream, prosecco, brown sugar, lemonade, and a violet-infused syrup. Both shakes were richly creamy and just potent enough. For our appetizers, we enjoyed spicy King Ranch Pizza and some amped-up Potato Skins. The pizza was full of interesting flavors and textures thanks to a zesty poblano-infused tomato sauce, grilled chicken, cheddar, corn tortilla strips, tomato, mushroom, red onion, cilantro, and jalapenos. The potato skins were topped with two kinds of cheddar cheese, black pepper bacon, and scallions…and they came with a sour cream and salsa for dipping. The movie was fantastic too…if you haven’t seen Vertigo, it’s classic Hitchcock and stars Jimmy Stewart. Do yourself a favor and rent it and give it a watch. After the movie, we headed to our hotel to rest for a bit and get cleaned up for our dinner reservation at Congress. This Zagat 28 rated restaurant is located on Congress St. in Downtown Austin. We walked in the door and were immediately impressed with the sleek décor, romantic lighting, and intimate dining room. We had the three-course dinner with wine pairings, plus dessert…and a surprise bonus course from Chef de Cuisine Rebecca Meeker. From the moment we walked in the door until we over 2 hours later, we enjoyed creative food and perfect wine pairings. As we sipped on a welcome glass of champagne, we selected our first course. All during the meal, the staff hand-selected red and white wines from around the globe that would perfectly enhance our dining experience. They did an amazing job! 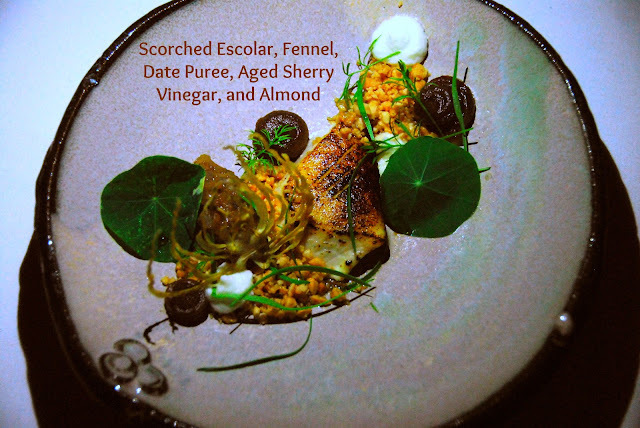 Michael selected the Seared Escolar with Fennel, Date Puree, Aged Sherry Vinegar, and Almonds. He said that the fish was cooked perfectly and that the sweet dates and tart vinegar worked very nicely together. I oped for the Red Kale and Beet Salad. 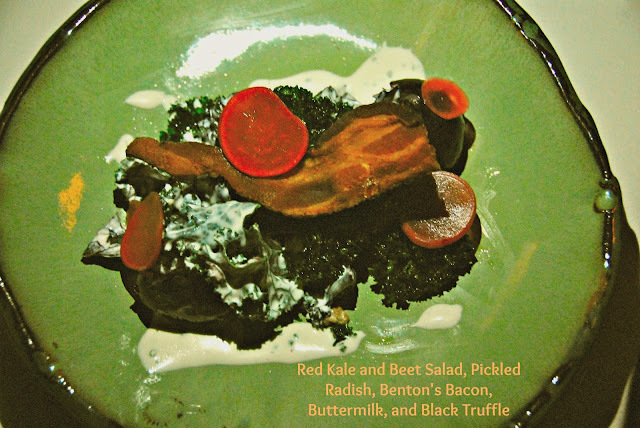 It came with pickled radishes, bacon, and was topped with buttermilk dressing infused with black truffle. This was such a creative salad! The kale was slightly bitter, which played very nicely with the smoky bacon, tart pickled radishes, and the earthy and tangy dressing. For our second course, we chose the same item. That's something we don't normally do, but we both were very intrigued by the Crisp Pork Belly with Charred Avocado, Green Chile Hominy and Bacon Marmalade. 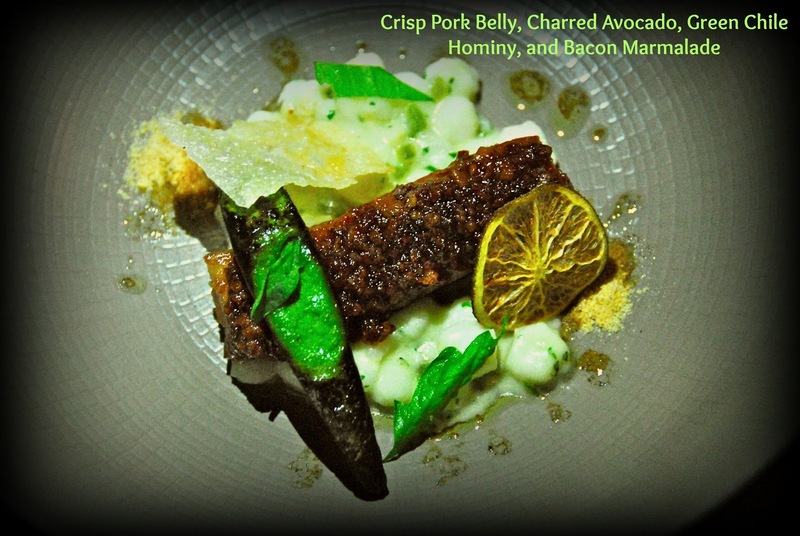 The rich pork belly was amazing, and the charred avocado had a mild smoky flavor. The hominy was spicy, but not overly so, and the bacon marmalade brought a touch of savory sweetness. So creative! Chef Meeker also sent out a surprise course from the menu for us to share: Garden Carrot Ravioli with Spinach, Gingered Carrots, Lemongrass, and Carrot Tops. This is not something I normally would have ordered, but it was fabulous! The ravioli was perfectly cooked, and the carrot filling was sweet and creamy. 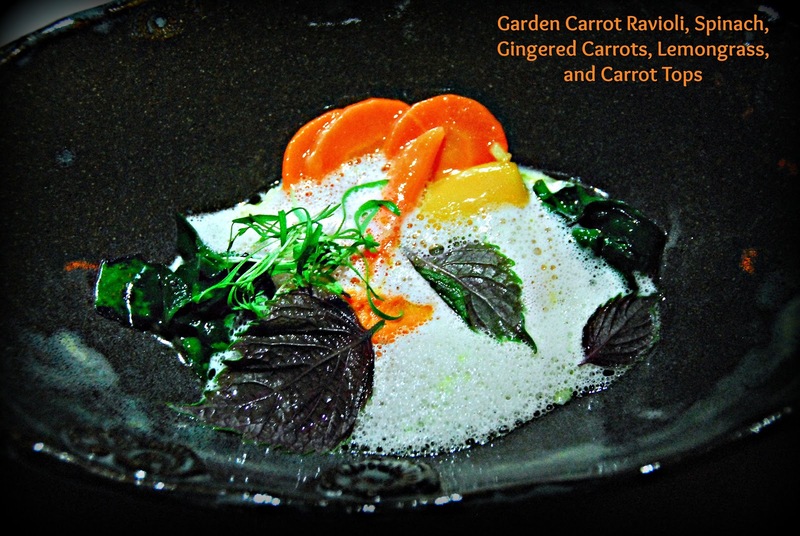 The gingered carrots provided a nice flavor and texture contrast, and the lemongrass foam was light as air on our tongues. Our entrees were next to arrive. 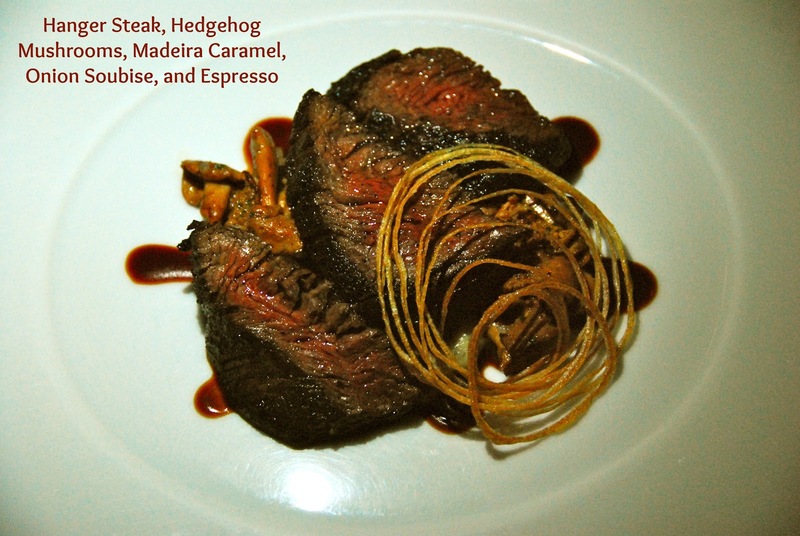 Michael opted for the Hanger Steak with Hedgehog Mushrooms, Madeira Caramel, Onion Soubise, and Espresso. The beef was tender and juicy, and the Madeira Caramel was complex and sweet. 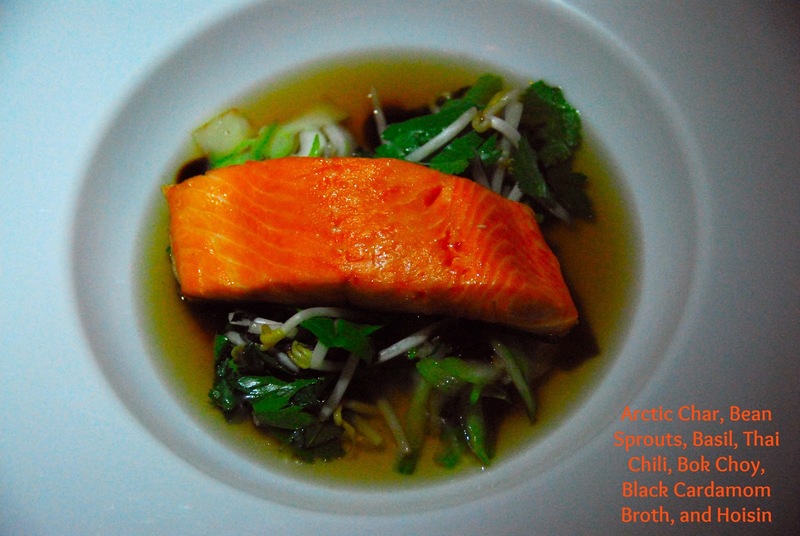 I decided to try the delicate-sounding Arctic Char with Bean Sprouts, Basil, Thai Chili, Bok Choy, Black Cardamom Broth, and Hoisin. This fantastic dish was Thai-inspired and totally sublime. The hot caradamom broth was poured over my rimmed bowl tableside, and the aroma made my mouth water. The cardamom was subtle – just a whisper in each bite, sort of like aromatherapy. The fish was perfectly cooked, and the bok choy and cilantro provided spice and texture. We were so full by then, but we couldn’t resist their creative and decadent dessert menu...especially when I saw the words Chocolate Seven Ways on the menu! 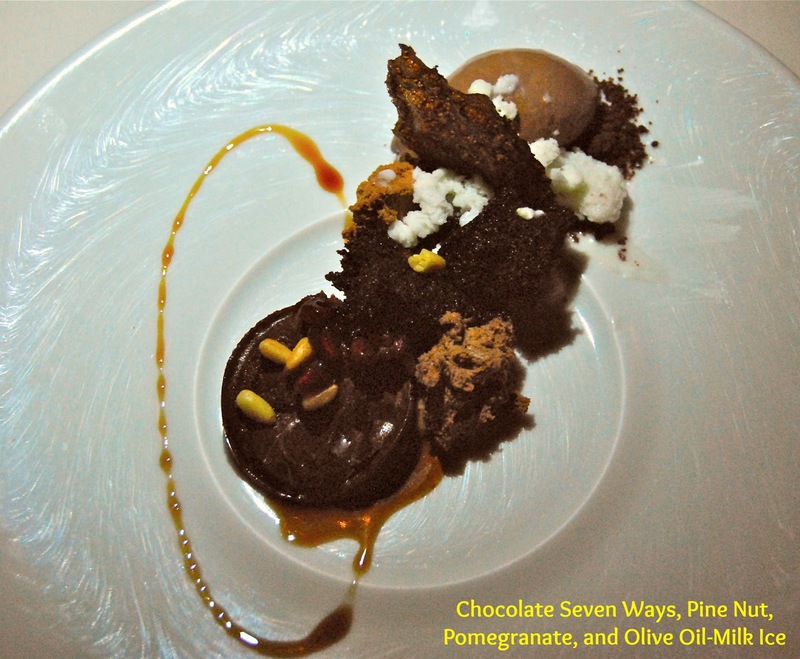 Chocolate one way is good…but seven ways? Please. Each of the seven chocolate presentations was literally one bite big, so it was properly portioned and not overly rich. My dessert was served with Pine Nut, Pomegranate, and a unique Olive Oil-Milk Ice. 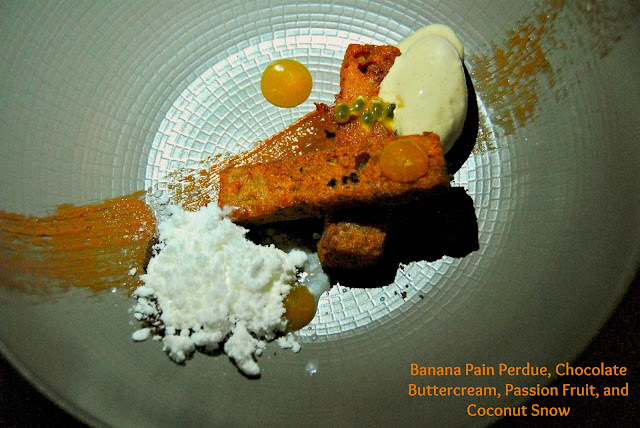 Michael opted for the Banana Pain Perdue, which was served with Chocolate Buttercream, Passion Fruit, and Coconut Snow. He said all the flavors combined perfectly together and that the portion size was just right. We left Congress very satisfied. The experience was upscale and gourmet, but not at all stuffy. The staff was attentive, the food was creative and expertly prepared, and the wine pairings were spot-on. For the quality of the food, the prices are a steal. In New York or Chicago, you’d easily pay twice the price for food of this caliber. We headed back to our hotel, but not before they sent us with a sweet goodie packaged to take with us to enjoy later. It was the perfect touch! We woke up Sunday morning and headed out for our final Austin culinary adventure...but it was strictly casual this Sunday morning! Our first stop was Torchy’s Tacos. 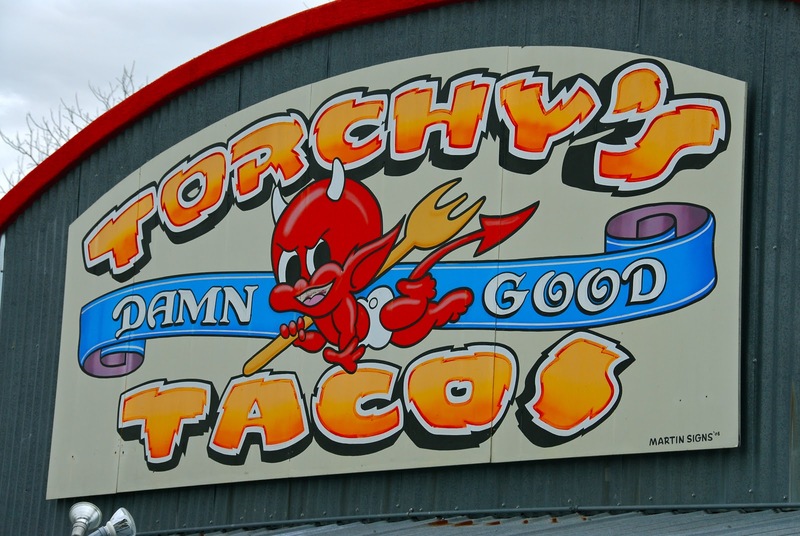 Torchy’s started out a few short years ago as one food trailer. Their tacos became so popular that they now have several locations in Austin, as well as locations in Houston, Dallas and Fort Worth. We stopped in to try their signature tacos, along with their award-winning Green Chile Queso. 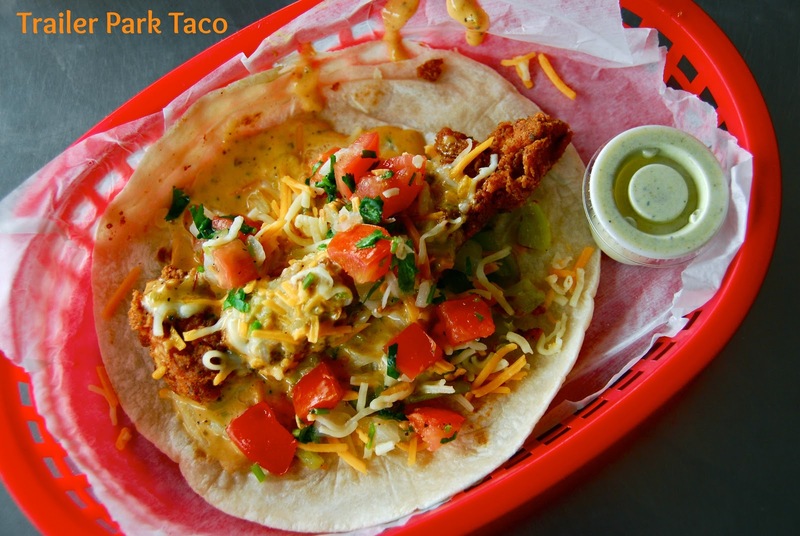 Torchy's menu offers everything from breakfast tacos to traditional tacos to fish tacos – even vegetarian tacos. While we waited for our tacos to arrive, we sampled some of their green chile queso. I live in Texas, so I’ve sampled a lot of queso in my life. This is – hands down – the best queso we've ever eaten. Perfect consistency, a nice kick…downright addictive! 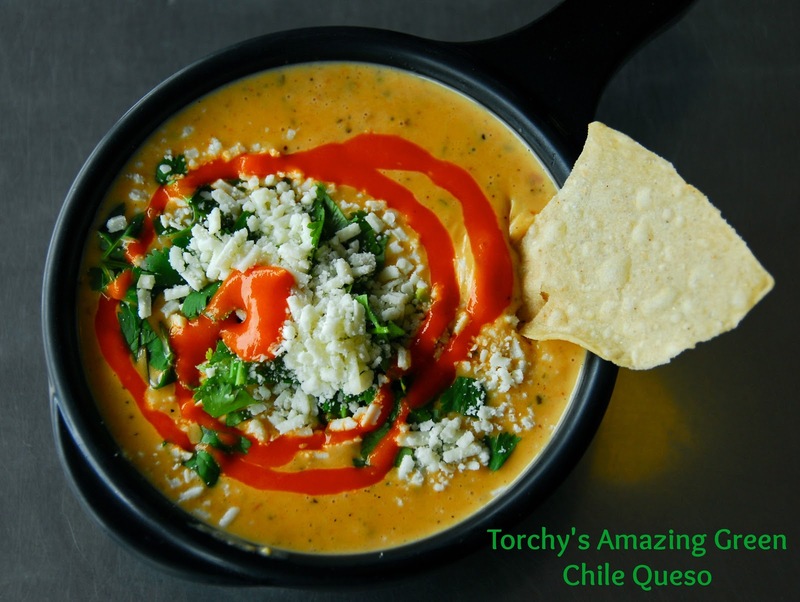 It comes topped with fresh cilantro, queso fresco, and diablo hot sauce. 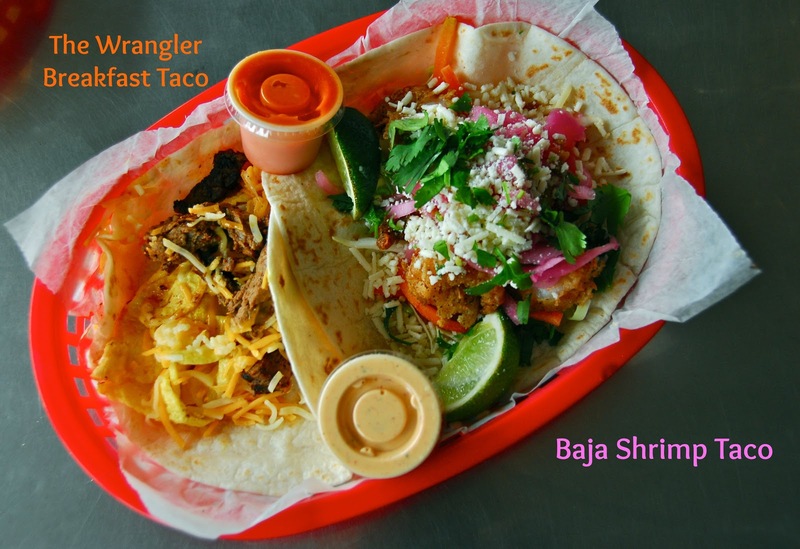 Our first taco pairing included The Wrangler Breakfast Taco and a Baja Shrimp Taco. The Wrangler was filled with eggs, potatoes, smoked brisket, and jack cheese. The Baja Shrimp Taco came with crispy fried shrimp, tangy cabbage slaw, pickled jalapenos, cilantro, and queso fresco. The shrimp were perfectly crispy, and the chipotle sauce served on the side gave it a nice kick. We wanted to try one of Torchy's original tacos...and one of their modern creations. The Green Chile Pork Taco is served on a corn tortilla and filled with savory pork carnitas, green chiles, queso fresco, cilantro, onion, and lime wedges. 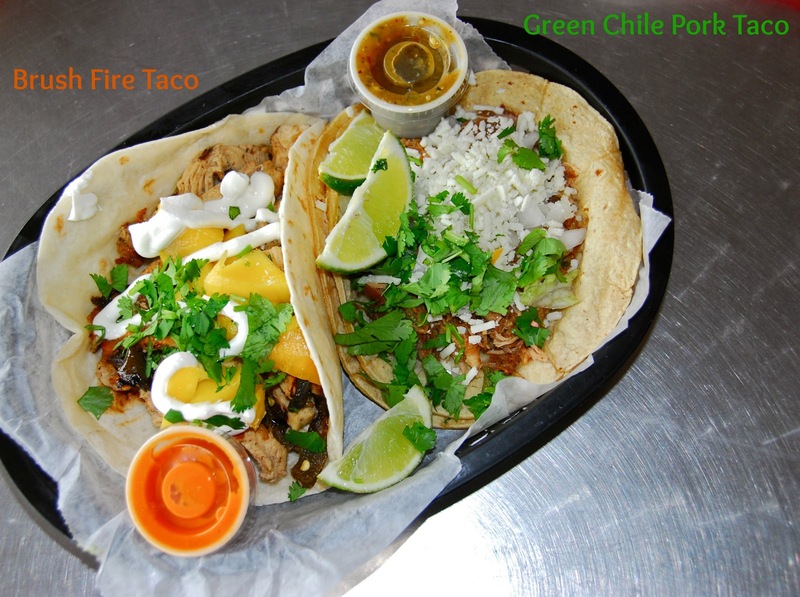 It's the taco that originally put Torchy's on the map, and it's easy to see why. It's flavorful and spicy. The Brush Fire Taco is a fun fusion taco that's filled with Jamaican jerk chicken, grilled jalapenos, mango, sour cream, and cilantro. The chicken is spicy and juicy, and the sour cream and mango provide a nice cooling effect. We especially enjoyed the sweet pop of flavor from the mango. 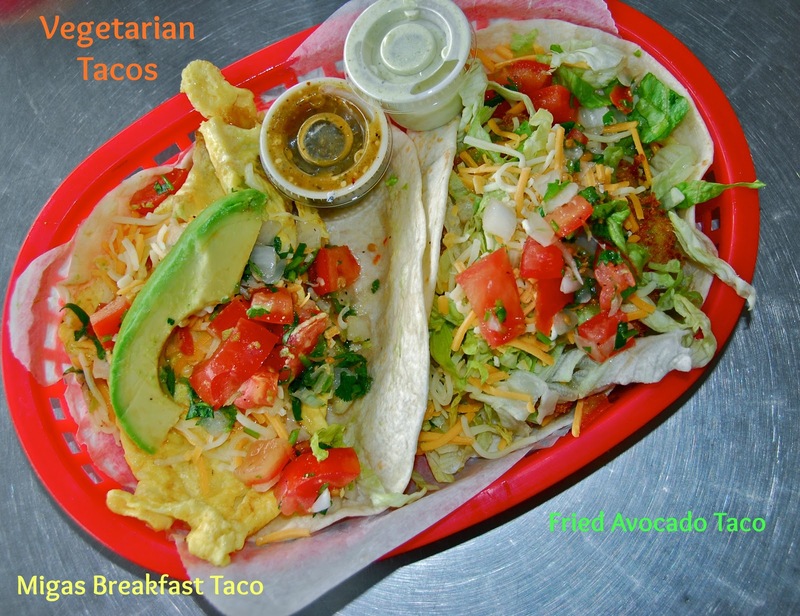 Torchy's also offers vegetarian tacos for non-meat-eating customers. We tried two of them, and they were fantastic! The Migas Breakfast Taco is filled with scrambled eggs, crisp tortilla strips, green chiles, avocado, pico de gallo, and shredded cheese. It is filling and full of flavor! The unique Fried Avocado taco contains crispy pieces of panko-breaded avocado, with vegetarian refried beans, pico de gallo, lettuce, and cheese. It was so tasty that I didn't miss the meat at all! The fried avocado is over-the-top good, and it combines perfectly with the other ingredients. Finally, we tried the featured Taco of the Month: The Trailer Park. It was filled with a perfectly fried chicken strip, green chile queso, pico de gallo, cilantro, and shredded cheese. It was fried, cheesy goodness. It was messy as anything, but that's why they have napkins on the table, yes? We walked out agreeing that Torchy's outdoor sign declaring their tacos "damn good" was not false advertising...it's the truth! These are indeed some amazing tacos. Great food, casual atmosphere, and reasonable prices. That's a trifecta that any food lover can appreciate. After our brunch at Torchy's, we had one final culinary quest: dessert. 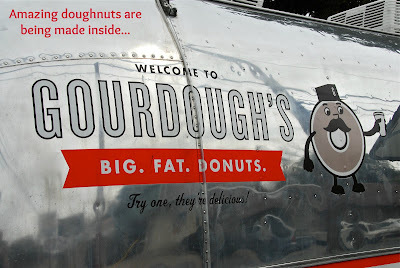 Everybody we met told us that we had to visit Gourdough's Big Fat Doughnuts before we left town. Since we never met a doughnut we didn't like, we stopped by to sample their signature flavors. Gourdough's Big Fat Doughnuts is housed in a vintage Airstream trailer, and these are not your typical doughnut. These are doughnuts on steroids! They're huge, and they come in a wide variety of creative flavors. 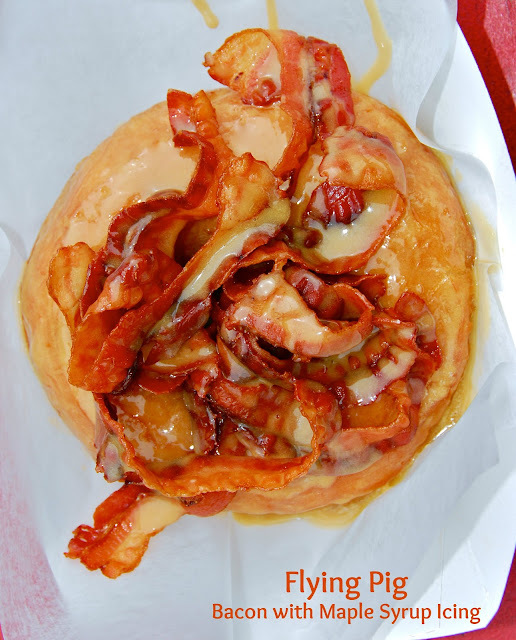 First, the doughnuts are fried...then they're topped with an amazing array of ingredients. There are even a few surprises on the menu...like the Mother Clucker, topped with a fried chicken finger and honey butter. We shared four of their signature doughnut flavors: Granny's Pie, The Puddin', Dirty Berry, and Flying Pig. Feast your eyes on these over-the-top doughnuts. We loved all of these doughnuts. The doughnut base isn't greasy, and you can tell they use quality ingredients in their toppings. Michael loves bananas, so he went crazy for both The Puddin' and Granny's Pie. 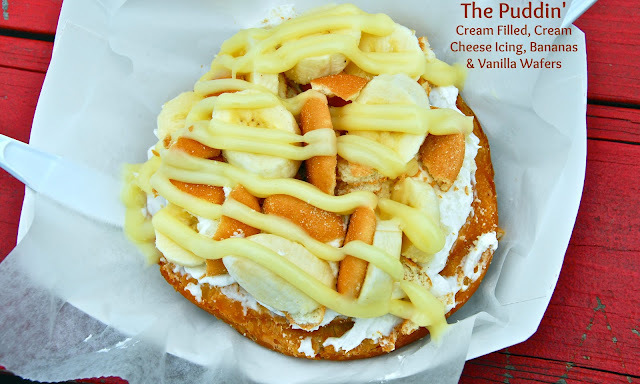 The Puddin' is basically southern banana pudding on top of a doughnut...genius! And addictive. 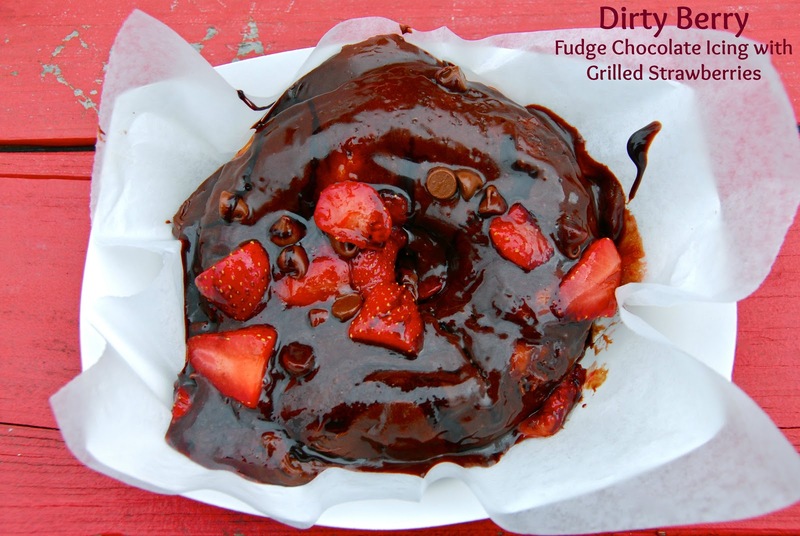 The Dirty Berry reminded me of chocolate-covered strawberries on a fluffy doughnut pillow. Messy, but oh so good! The one that we both agreed was the most surprising was the Flying Pig. 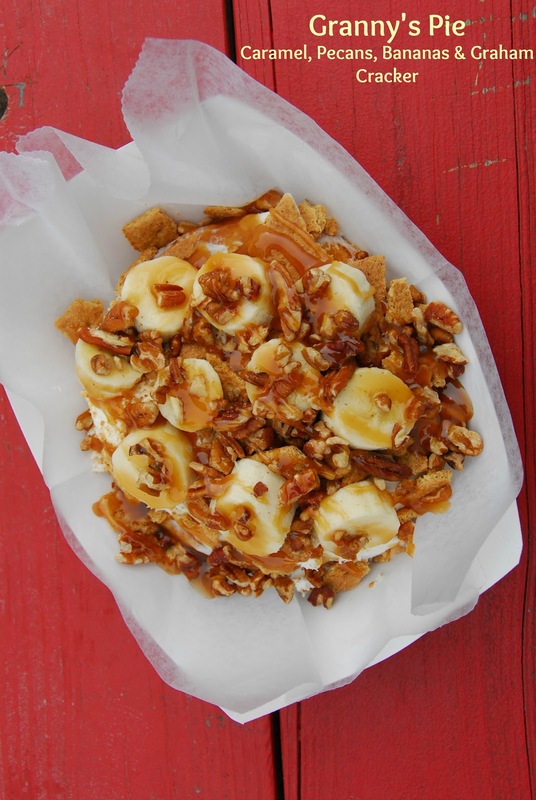 The bacon and maple combo reminded us of having waffles and bacon for breakfast. It was out of this world. Gourdough's was the perfect ending to a fantastic food lover's weekend. 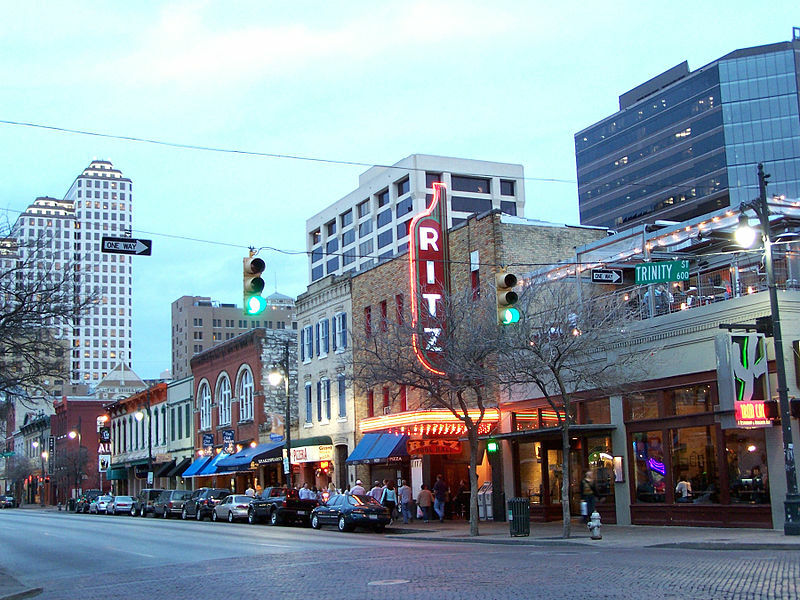 No matter what you want to eat, chances are you'll find it in Austin! From amazing doughnuts and tacos, to upscale gourmet fine dining, to Japanese-American fusion, to upscale comfort food...and even New York-style pizza and vegan cupcakes...Austin has it. Mix in great people watching and friendly Texas people, and you've got a perfect spot for a weekend getaway. Disclosure: The restaurants and movie theater featured in this article provided us with complimentary food, drinks, and movie tickets to facilitate being featured in this article. All opinions are mine, and all photographs are copyright 2013 by Michael K. Garcia. Unauthorized reproduction is expressly prohibited.